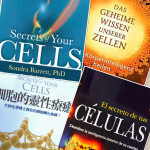 Secrets of Your Cells Reviews | Sondra Barrett, Ph.D. | Sondra Barrett, Ph.D.
“Hi Sondra, My wonderful husband ordered your book (Secrets of Your Cells) for me for Christmas. He is now devouring it just as I did, and cannot resist reading me bits as he goes through it. As I did to him. I am a naturopath (herbalist and nutritionist), in Australia. I found your book illuminating to say the least. I was researching neuroplasticity of the brain a couple of years ago (delivering a workshop to naturopaths) and am thrilled to learn more about how our thoughts can (and will!) shape our wellbeing. After 20 years of clinical practice, while I love to make up herbal formulas and occasionally recommend supplements (usually minerals in simple form) to kick-start things along, I am finding more and more these days my recommendations veer towards encouraging clients to find a way to achieve calm in their lives, because it seems we are facing an anxiety epidemic and this seems to be the backdrop to so much illness. One result of the Age of Enlightenment’s attempt to divide each person into discrete elements is a profound sense of disconnection between our spirits and our bodies. This disconnect, a hallmark of societies in which technological advances have outstripped innate wisdom, may help explain rising rates of emotional illness, anxiety,depression, as well as the rootlessness that afflict so many people. But what if the body itself provided the blueprint for a renewed union of our physical and spiritual selves? Biochemist Sondra Barrett started out believing that health was a simple matter of addressing chemical imbalances. Then she saw living cells under the microscope for the first time and was “enchanted by what I was seeing.” Thus began a journey that has culminated in Secrets of Your Cells: Discovering Your Body’s Inner Intelligence. Sondra Barrett is a biochemist whom you are as likely to find meditating or performing a qigong movement to drum music as peering into a microscope. For her, the visible and the invisible are not so much reflections of each other as places along a great continuum. Biological cells are more than the basic constituents of life, she says in her book, Secrets of Your Cells: Discovering Your Body’s Inner Intelligence; they are “little crucibles of measurable, discernible biochemical interaction that also carry the seeds of divinity.” They might not be self-conscious in the sense of “I think therefore I am,” but they embody consciousness. They have memories—lymphocytes, for example, are immune cells that recognize specific viruses—and they carry the blueprints of our familial past in their DNA and, very possibly, the accumulated wisdom of the ages. Just as we do, our trillions of cells breathe, eat, assimilate, eliminate, recycle, and regenerate. They thrive in community and in relationship to one another; they sense their environment and respond to it; they recognize enemies and attack them, and they recognize friends, whom they embrace. “One scientist who is busy reinventing herself and her profession by regaining awe as a priority is Sondra Barrett. 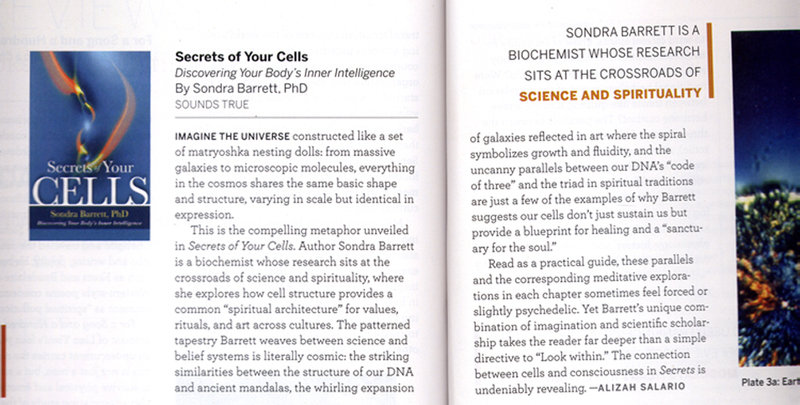 Barrett has brought awe into her life by asking different questions about her specialty, biology, and by connecting biology to photography so that she and others can actually meditate on the awesome wonder of the cell itself. Barrett talks about the cytoskeleton, the vibrating dynamic matrix of the cell, as the true mastermind of cell intelligence, which helps manage and coordinate cellular operations. How significant is the work of the cytoskeleton? “Sounds True has done it again. Where do they find their amazing authors? I have been so well educated and inspired over the years. 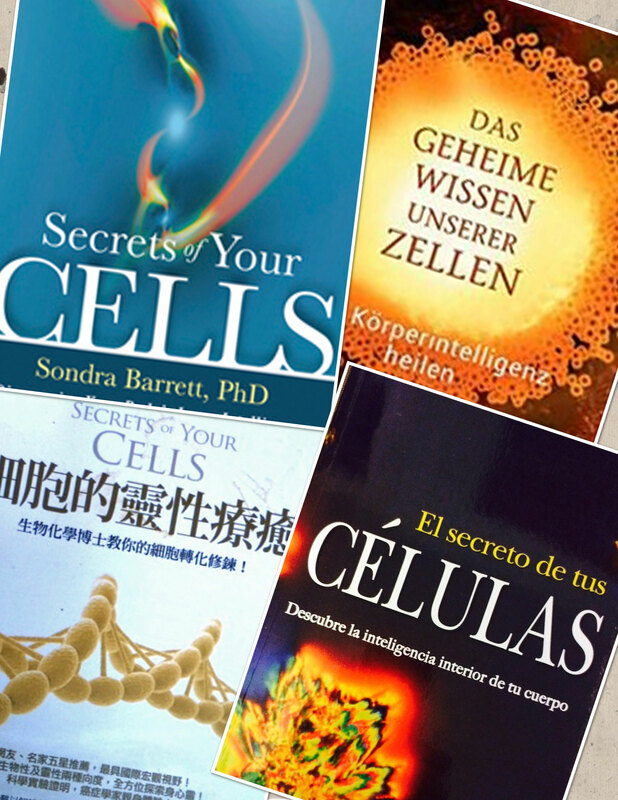 Sondra Barrett, PhD has joined their ranks with her fascinating new book, “Secrets of Your Cells,” a practical guide for applying the innate wisdom of our cells to our health and spiritual lives. “Our cells are more than just fortuitous arrangements of chemicals,” explains Dr. Barrett. “They are a community of trillions of sentient entities cooperating to create a sanctuary for the human soul.” Dr. Barrett takes us on an exciting adventure of seeing the inner workings of our bodies in a new way and she demonstrates how our physical lives relate to this vast universe in which we live.